Cardinal Gianfranco Ravasi, President of the Pontifical Council for Culture and President of the Pontifical Commission for Sacred Archeology, was born in Merate, Italy on 18 October 1942. He was ordained a priest of the archdiocese of Milan on 28 June 1966 and studied at the Pontifical Gregorian University and at the Pontifical Biblical Institute. He taught the Old Testament at the theological faculty of northern Italy. 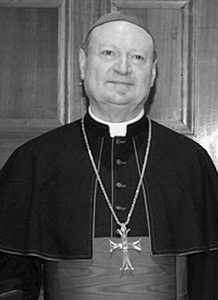 From 1989 to 2007 he served as prefect of the Ambrosian Library in Milan. He has written may books, articles for L’Osservatore Romano and L’Avvenire and hosts the television show Frontiers of the Spirit. He was consecrated on 29 September 2007. Since March 2012 he is president of the cultural association Casa di Dante in Rome, dedicated to making the works of Dante known throughout Italy and abroad. Created and proclaimed Cardinal by Benedict XVI in the consistory of 20 November 2010, of the Deaconry of San Giorgio in Velabro (Saint George in Velabro). Pontifical Councils: for Inter-religious Dialogue; for Promoting New Evangelization.